Some of you may remember Mr. Carl Nourse and his Columbus, Cleveland & Northern Railroad in Delaware, Ohio. Carl’s facility was in the old NYC freight house off Central Ave, and across the main track from the brick passenger station. Inside this wood frame freight house Carl amassed a large Lionel standard gauge layout, with nearly every item Lionel ever made for this scale. 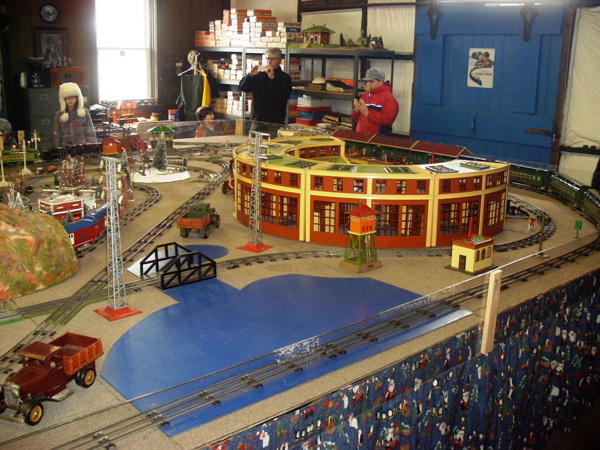 Other “O” gauge layouts were intermixed within the freight house building, an on-site baggage car and boxcar. For several years, typically the Saturday before Christmas, Carl would open his private collection to the public. “For the children”, as Carl would say. Carl could get quite emotional about pleasing young children. The open house, I am sure, was expensive to put on. 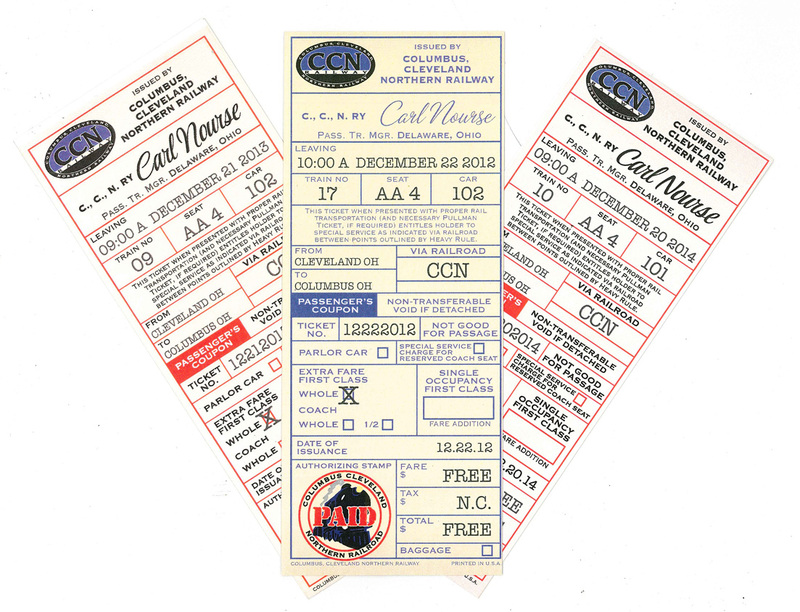 Carl hired Delaware City Police to direct traffic, passed out CCN engineer hats to the children, and had annual “train tickets” printed. Tickets to the annual Open House at the Columbus Cleveland & Northern Railway at the old New York Central freight house in Delaware. I and others with Fritz-Rumer-Cooke had the pleasure to do business with Carl on more than one occasion. He was always an honest and forthright man, whose handshake was a good as a written contract. Carl had the same old school values those of us with FRC were also brought up on. One project Carl had FRC do was to assemble a second spur track just inside the active curved track that served the OhioGro fertilizer facility, located north of Central Ave. from the freight house. On these two tracks he could store and work on a growing collection of actual railroad cars and motive power (being of 12-inches to the foot scale, if you will). Carl wound up collecting on these two tracks, two small Plymouth locomotives (a 2 axle and a 4-axle version), a passenger coach, a diner car, a caboose, and the office car once used by George Silcott in Worthington. 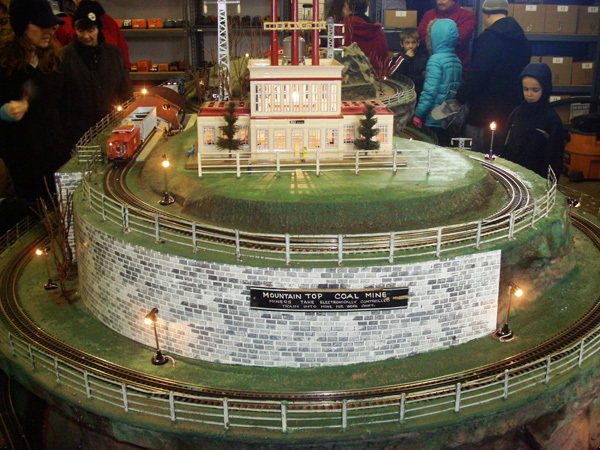 The four-axle Plymouth locomotive, the coach, diner and office car were last used for Carl’s free holiday train rides back and forth down the active 1,000-ft spur. Again, all for the children. The second spur track was a dead ended on either end. The cost and legalities to have a turnout installed in the active spur was more than Carl wanted to get into, requiring CSXT track design approval, and construction to strict CSXT specifications. So, on two occasions, FRC was asked to “cut and throw” the active spur over to temporally connect the live track to the dead end spur. I personally oversaw the first track throw in 2012. The task was to first locate a proper location to do so (taking advantage of existing track joints and such). The track shoulder was excavated to allow the track to be shifted over, creating a curved lead to the end of the dead track. Then cut and fit rails to make the temporary connection. Prior to the track throw, three passenger cars were positioned ahead of the work. The lead car was diverted into the dead spur, the middle car was dragged back down the active track, and the heavy six-axle office car pulled onto the dead spur. This meant the cut and throw was done twice that day to arrange the cars in order to Carl’s liking. Given these were passenger cars (at 70+ feet long), and the track was temporary, great care had to be made to give them the most level and sweeping curve possible, otherwise the car’s draft gear could bind and derailment occur. Though I was biting my fingernails, we pulled it off well for that 2012 move. The following year, we were asked to do the same stunt. I was unavailable to manage the project for this second cut and throw work. And apparently the temporary constructed curves were made too sharp for the equipment and the office car was derailed. After much fussing and a bit of cussing, the crew was able to “walk” the car back onto the rails with minimal damage to the car. Not every railroad project goes as planned, and this one was proof. I had the pleasure to attend Carl’s last holiday open house, finding myself riding the train on the very last run for the day, made just for Carl, his family and his many volunteers. While gawking at the interiors of the coupled passenger cars, back we rolled one more time with me alone in the observation area of the office car, watching the track as we rolled back and then forward. On returning to the coach and finding Carl there with his family, I informed him I had just performed the official duty of a rolling track inspection from his office car, finding no defects to report. After Mr. Nourse’ passing in 2015, I attended the public sale of the remaining contents of the freight house. Though the auction was a cold business-like affair, I was pleased to once again encounter several of the volunteers to Carl’s past holiday open houses and others who knew Carl personally. At the action, I was able to win the bid on several items of Carl’s that were directly connected to his open house adventures. These, for me, help to keep the memory alive of a short lived Central Ohio railroad tradition and of a man who so loved the children. Young folks are enjoying Carl's annual Open House. Another view of the Carl Nourse Lionel Standard O Gauge Layout. 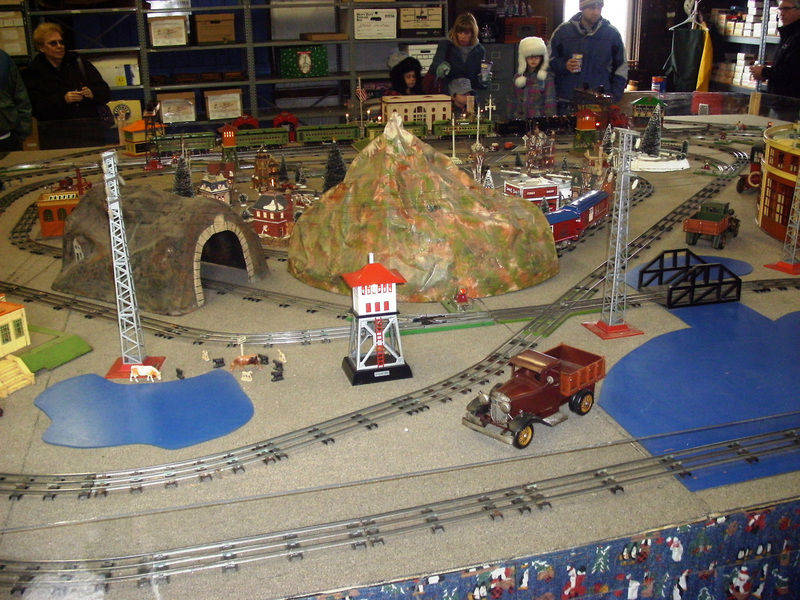 The Mountain Top Coal Mine - a Lionel Model layout once displayed at COSI in Columbus.